A couple nights ago we carved pumpkins. Pookie liked drawing the faces. Geetle liked trying to cut the pumpkins. Beagoodmom liked taking the pictures. I liked eating the seeds. Everybody had a great time. 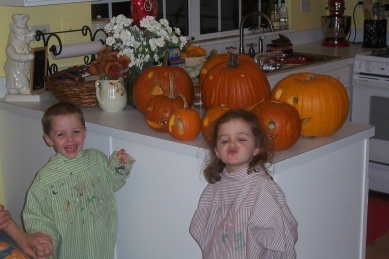 The kids have been to the pumpkin patch a few times so we had plenty of pumpkins. So, fall is officially here. Afterward, and already a little past bedtime, we decided to go for a nice fall walk…because I noticed that it was snowing. Yes, snowing. We through on our boots and started walking. At the end of the street we all wanted to turn around, but Pookie asked us to keep walking. By the time we got back, his cheeks were all red and he was very happy. During the pumpkin carving the Geetle got a little riled up and decided to give you all a very special Halloween greeting. Update: For all of you reading this through a feed reader, there is a video here that may not get displayed unless you come visit. Sorry. Twins- Do they keep you up all night?